Did that sound like a tongue twister? Anyway, a don is basically a rice bowl and kaisen means seafood. 丼丸 (don-maru) is one of my favourite shops due to its wide variety (you can eat a different don once a week for over a year! ), and economical pricing. And if 540 yen is not cheap enough… a discount is given on all 丸 (maru) days. maru basically means a circle (or zero in this case) and thus 丸の日 applies to all days of the month which end with a zero (i.e. 10th, 20th and 30th). My personal favourite is the 魚河岸丼 (uogashi-don), which translates to ‘riverside fish market’ don. The ingredients include tuna slices, salmon roe, sea urchin, and minced tuna with onion. Pretty good deal for 500 yen. One-coin lunches are quite popular in Tokyo, particularly among the working lunch crowd. Downtown Tokyo (defined as the area bounded by the Yamanote line) is not exactly a large area and distances are usually measured in kilometers rather than tens or hundreds of kilometers. 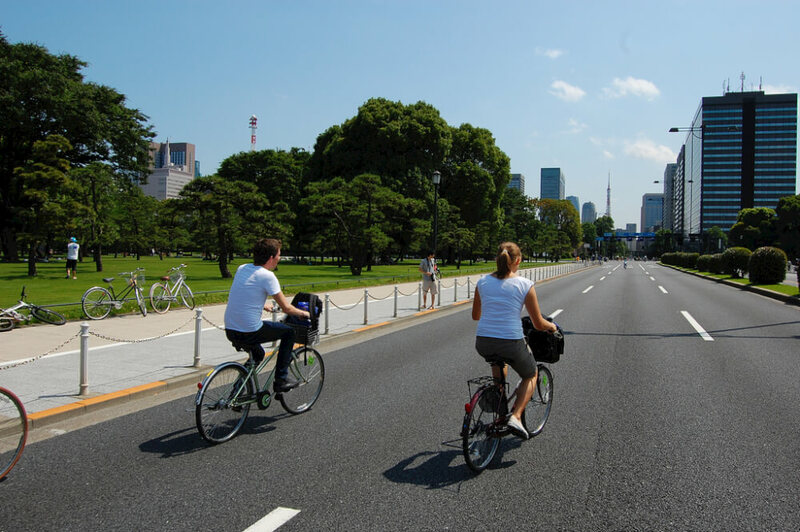 Cycling is extremely efficient form of transport in Tokyo as you can snake through the alleys, and ride on pavements. Being a safe city also helps, as you can leave your bicycle parked while exploring certain places on foot. Bicycle rental is available in many parts of the city and can be as cheap as 500 yen for an entire day. For more details on cycling in Tokyo, read this article. Cycling routes are also available here. Cyclists on the road in Tokyo. Photo credits: Héctor Ratia. A 500 yen coin can sometimes be worth a lot more too!